Poison is anything with an inherent property to destroy life or impair health. 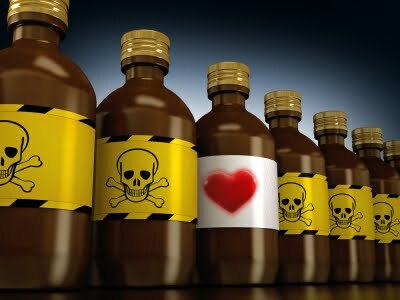 Poison is harmful or pernicious as to one's happiness or well-being. Poison contaminates, pollutes, taints, retards, inhibits. Simply put, what is poisonous to us will indeed kill us! Yet... every day people choose to absorb poison. We choose to eat chemically laden foods. We choose to work too much and sleep too little. We choose toxic environments... toxic relationships... toxic lifestyles. We eat junk food, ingest chemicals, smoke cigarettes, avoid exercise, forget to breathe in fresh air, and fail to expose ourselves to nature and sunshine. We lock ourselves in little boxes and accomplish little things. And don't forget about our stress. We thrive to be stressed. In fact, we skillfully find more and more ways to stress about our stress. Yes, as a race, I think we are our own worst enemy. We are a community of addicts who invite in the cancer of destruction. We experience needless pain and misery all because we complicate our lives with the maddening toxicity of sin. Sin that corrupts and deadens us from living up to our full potential. Sin that poisons the health that God originally intended for us to enjoy. Benjamin Franklin once said, "The definition of insanity is doing the same thing over and over and expecting a different result." So, if we are persistent to pursue what is poisonous but still expect to live healthy... are we insane? Has our mental capacity been compromised? Is our judgement sound? The truth is, humankind is indeed messed up. We are broken and damaged beings. As such, without assistance... without help... we are lethal to ourselves. This is why God's Word is so important. This is why Jesus' sacrifice and simple truths are the only solution - the only Way we can ever experience and know real freedom. The truth is, the blood of Jesus carries our only antidote from the poison of sin. It's amazing how far away we can live from God, isn't it? He has given us everything necessary to know Him and live healthy, holy lives. Yet we continue to choose the poison of sin rather than the simplicity of His holiness. We allow toxicity to win out over and over and over. We continue to destroy ourselves - going our own way, doing our own thing, choosing ourselves instead of serving Him. And sadly, we still expect a different outcome/result - always forgetting that God is no respecter of persons. Forgetting that His absolute Word will hold true no matter who challenges it's validity. The Bible says, "My people are destroyed for lack of knowledge." (Hosea 4:6, NKJV) This could not be more true. Our antidote, Jesus, cannot heal our poisoned lives if we continue to impair ourselves by avoiding His Word. Rather, we will remain toxic and sick if we ignorantly believe we can somehow become close to a King whom we won't bow down to... whom we won't allow to reign in our lives. Satan is a venomous snake who wishes to keep us distracted from the biblical danger signs that our Redeemer has provided in order to warn us away from the poisonous trappings of sin. Stop believing the insanity of the devil and instead seek Jesus to rid the merry-go-round of the enemy's sickly ways. Choose to follow the holiness of the one true King! For only God's Word is medicinal to our spirits... only Jesus is capable of strengthening the marrow of our bones! Ladies, a new life has been offered by the King of kings. A new hope to know the Creator of the universe is detailed within the pages of sixty-six chapters of scripture. Without Him, we can never live up to our full potential. Without Him, we will never be healthy or know freedom from the maddening toxicity of sin. Without Him, we will die from poison. Knowing this, what will you do next? Will you continue to ignore the King? Or will you consider the perfect advisement of the loving Savior? Will you continue consuming poison? Or will you choose to be healed by His holiness, His counsel, His rule? I encourage you to take your next step in the right direction - His new direction! Everyday, may we each live deliberately and bow down to His throne. Everyday, may we each know a healthier life in Jesus Christ while offering ourselves in worship to the Lord of all lords! With much love & respect <3 God bless you always!